Download the Lead Captain help file for a more detailed description of the latest version of the program, and all its features. Your RHO opens 1NT (15-17). Since your methods won't let you show diamonds below the 3 level, you pass. The bidding proceeds 1N-2C-2D-2N-P. LHO has a 4 card major with invitational values; RHO doesn't have a 4 card major and didn't accept. Lead Captain is the perfect program to answer that question. Define the three unknown hands. 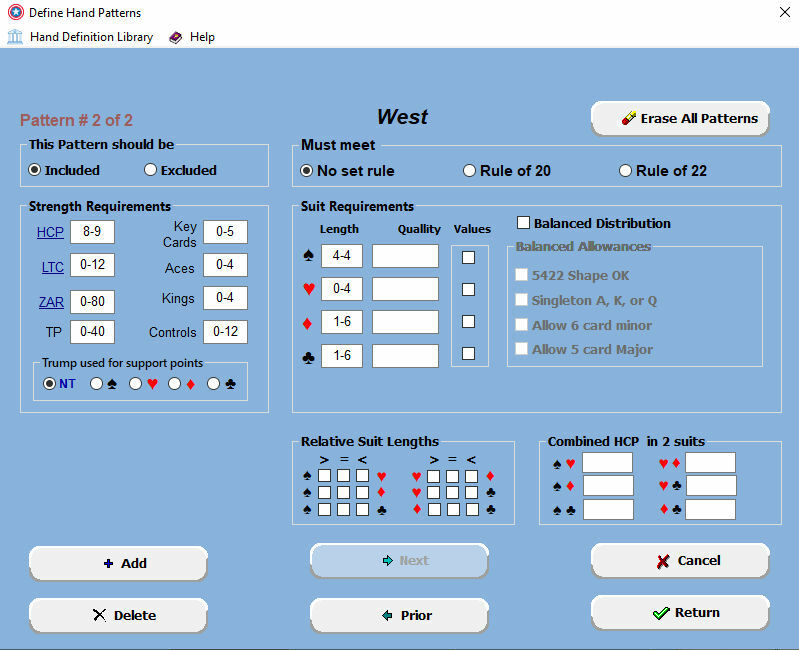 As you type in each suit, the cards will automatically be sorted by rank. Since Stayman was used, we expect dummy to hold a 4 card major. Thus TWO patterns are defined for the dummy's hand. Buttons on the bottom let you add/delete additional patterns as well as display those patterns with the Prior/Next buttons. The first pattern sets the heart length to exactly 4 and the spade length to 0-4, while the second pattern sets the spade length to 4 and the heart length to 0-4. You may wish to set different parameters - the choice is yours. As long as a hand mets one of your patterns, it will be included. There's also a feature to exclude a pattern(s). Declarer didn't accept the invite so his hand has been limited to 16 HCP. Partner didn't bid so there's noting to define for that hand. With Lead Captain you can be as sophisticated as you want in defining the hands. "TP" means "total points" - the sum of HCP plus one length point for each card over 4 in a suit. You can also specify the total number of aces and kings as well as suit quality and controls in each suit. 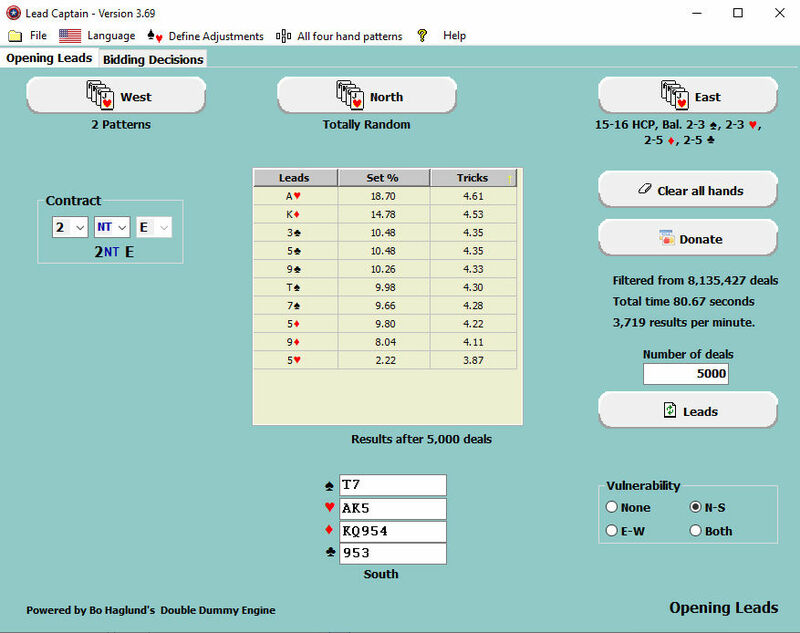 Specify the Contract and Click: "Best Leads"
In a little more than 2.5 minutes these results were available for a very large sample set of 5,000 hands. "Fourth from longest and strongest" was not nearly the best lead on this example hand. 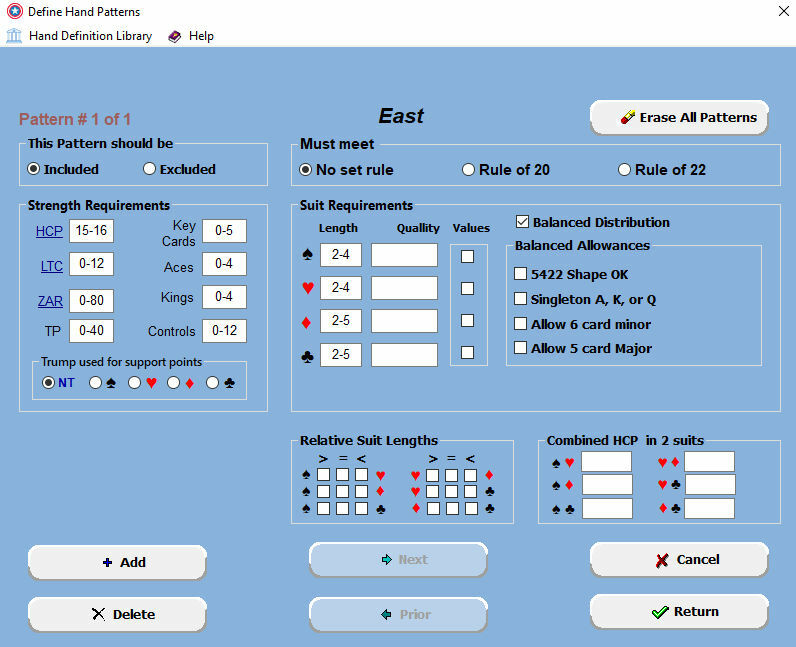 Lead Captain first removes the leader's 13 cards from the deck; then shuffles and deals the remaining cards until if finds a deal that fits all three hand definitions. Almost 8 million random hands were dealt to arrive at the 5,000 for the above example. After it finds a deal that meets all the criteria - it then plays double dummy, based upon each possible lead by opener using Bo Haglund's super fast double dummy engine. The program takes advantages of all the cores in your processor. The above example was done on a PC with an Intel i3 chip running 4 threads simultaneously. You can save all the deals in a PBN file, including the results for each possible lead on each deal. This allows you to open the file with DDS and review each hand. When the specified "Number of deals" have been played, results are displayed. You can also save those results, along with the hand definitions, in a small .ini file. At a later time, you can get those results and tweak the definitions, and/or rerun the study. Purchase Lead Captain and get free updates to the program for a full year.